Play has been suspended for the rest of the day at the PGA Championship, where a band of strong storms brought heavy rains to Bellerive Country Club. Nobody in the afternoon wave Friday finished their second round, which means big names such as Tiger Woods, Rory McIlroy and Justin Thomas will have to resume play at 7 a.m. Saturday. The cut line is currently even-par. The low-70 and ties will begin their third round about 30 minutes after the second round concludes, going off in groups of three off the first and 10th tee. Gary Woodland is the leader at 10 under, one shot better than Kevin Kisner. Both of them were in the morning wave and finished their rounds without any issue. Play at the PGA Championship has been halted because of approaching storms. The siren calling a halt to play sounded shortly after Tiger Woods hit his second shot on the par-5 eighth hole. 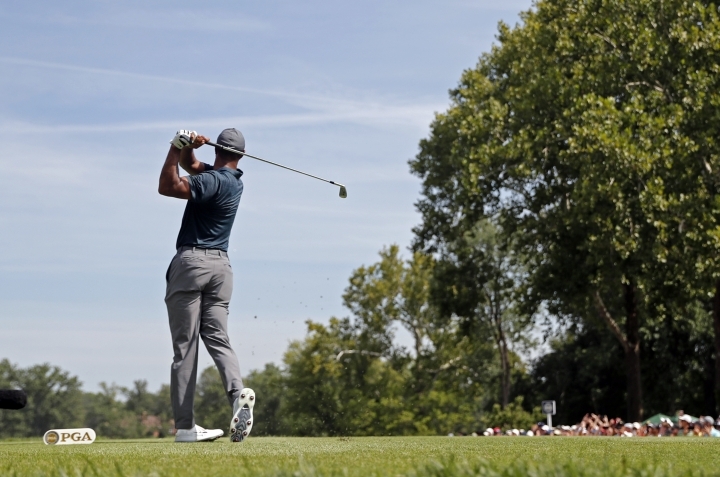 Woods was 3 under through seven holes and 3 under for the tournament — seven behind leader Gary Woodland. Earlier in the day, Brooks Koepka and Charl Schwartzel shot 63 to tie a PGA Championship record. It was the first time two players had posted 63 on the same day at a major since Jack Nicklaus and Tom Weiskopf did in the opening round of the 1980 U.S. Open at Baltusrol. No pressure, guys, but there are good scores for the taking at Bellerive. 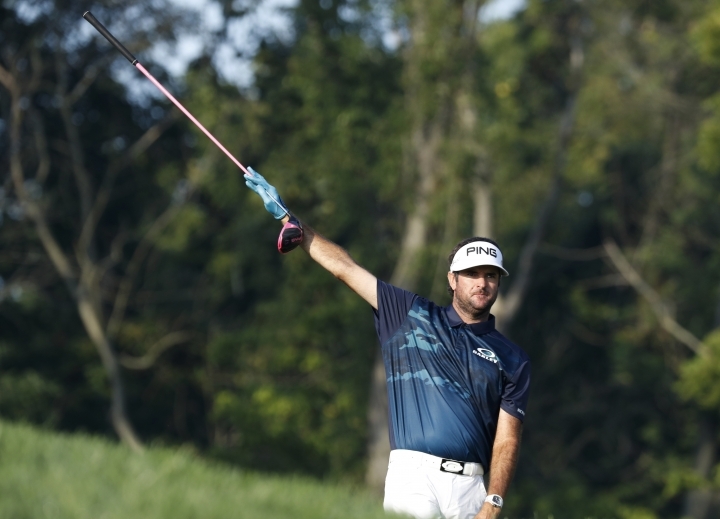 After watching Charl Schwartzel and Brooks Koepka each tie the PGA record of 63, the afternoon wave is out on the course with plenty of ground to make up. Tiger Woods and Rafael Cabrera-Bello are among the few closing in. They each have three birdies on their front nines to get to 3 under for the tournament — seven behind leader Gary Woodland. Defending champion Justin Thomas and Rory McIlroy are in neutral. Thomas has made only one birdie and is at 2 under. And McIlroy has opened the day with seven straight pars, including a save from 15 feet on No. 7 after hitting into a bunker from 105 yards away in the fairway. He's at even-par, just inside the current cut line. Tiger Woods is getting in on the birdie bash at Bellerive. Woods opened his round with three birdies over the first five holes to get to 3 under for the tournament. There's pressure on the afternoon players, following a morning round that produced two PGA-record scores of 63. And even though Brooks Koepka and Charl Schwartzel posted those numbers, they weren't winning the tournament. It was Gary Woodland in the lead at 10 under, after shooting a 66. Tony Finau has the flat stick working. He has made six birdies over the first seven holes. 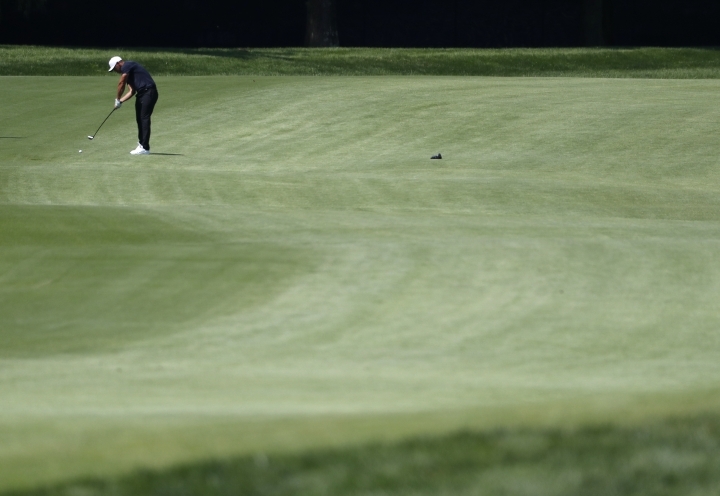 Five of those birdies have come on putts of longer than 20 feet. The other — an "easy" 10 footer. The only hole Finau didn't birdie was No. 6 — a long par 3 where he teed off into the water and ended up making 6. He is 3 under for the day, and now 1 over for the tournament, with the cut line currently at even-par on a low-scoring day at Bellerive. Ben Kern made a birdie on the 18th hole, and now has to wait through the afternoon to see if he'll be the lone club pro to make the cut. Kern, who works out of Georgetown Country Club in Texas, made the birdie to shoot 1-under 69 and get to even-par for the tournament. The top 70 players and ties will play the weekend, and when he left the course, Kern was among the group above the line, in a 14-way tie for 60th. 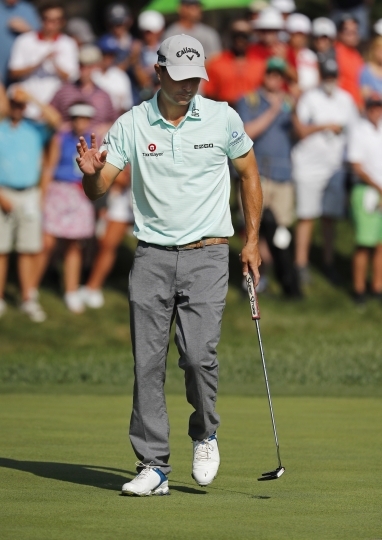 Others who finished the day at even-par for the tournament were Kevin Chappell, Nick Watney and Ted Potter Jr.
Charl Schwartzel matched the low round at a PGA Championship with his 7-under 63 on Friday, about half an hour after U.S. Open champion Brooks Koepka did likewise at Bellerive. There hadn't been two 63s on the same day in a major championship since the 1980 U.S. Open, when Jack Nicklaus and Tom Weiskopf shot rounds of 7 under at Baltusrol. Schwartzel had 30 feet for birdie at his final hole, which would have given him a 62 and matched Branden Grace's low round in a major. Schwartzel wound up with a two-putt par. Schwartzel and Koepka didn't approach the best rounds relative to par at a PGA. That record is 9 under, set by Gary Player at Shoal Creek in 1984 and matched by Jose Maria Olazabal in 2000 at Valhalla and Hiroshi Iwata three years ago at Whistling Straits.